I was excited to be asked to try this as it's exactly the sort of product that I'd normally go for. Brands including Clinique and Estee Lauder feature heavily in my regime so I'm familiar with the brand. I liked the packaging which is both sleek in appearance and functional with a pump dispenser & clear directions. The product itself is designed as a chemical exfoliator and has a gel cream consistency, like a serum, which makes it easy to work with. A little goes a long way. Although easily absorbed, I could feel the product on my skin which might not be to everyone's liking. There is a slight scent but it's certainly not offensive. 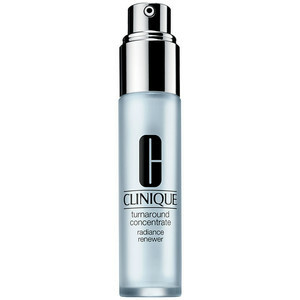 I found it easy to fit Clinique Turnaround Concentrate Radiance Renewer into my regime. I liked the product and felt that it improved the radiance of my skin & blemishes healed slightly more quickly than usual. Otherwise, I didn't notice dramatic results so perhaps it would be better suited to someone more mature on whom the results would be more noticable.